No Smoking at the Opera House! I thought of entitling this post Partenope 2.5. On Saturday afternoon, driving to Upper Colo for a short sylvan sojourn, I caught Acts II and III of Partenope in their live broadcast. I’m sorry I missed Act I, as that would have given me a chance to see if there was something I’d missed the first two times. Ah! The beauty of live performance! Of course, product placement is an issue, but I’d be disappointed, over all, if we’d reached the point where stage representations of smoking had to be banned in operas, even if the days of Carmen sponsored by [insert manufacturer of your favourite brand of cigarette] have passed. It’s not as if the audience is likely to have been particularly young and impressionable. On Wednesday night to Partenope again. It seemed to get a warmer reception than the previous Tuesday, even if some of the enthusiasm sounded a bit like company rush. For that matter the house seemed a little fuller than the “seats available” on the booking page suggested. Catherine Carby was back on board and, yes, as you would hope and expect, she did have more to offer, vocally, than Sian Pendry, who stepped in as understudy when I first went. Jacqueline Dark tired a bit in her first act closer – this (the tiring, not the aria) had something to do with vehemence in English with runs in the lower part of her range, and it must be said it is a pretty taxing number. Diction, incidentally, was commendable in all. I’m not totally convinced by Handel as a humorist. Some of it is the vexed question of humour in opera: not many operas are really funny. The humour can tend to be a bit forced. It’s when the humour yields to pathos, however contrived, that the opera begins to work, and that really is in the second and third acts. Nor do I find Partenope herself a particularly sympathetic or attractive character and I’m immune to the charms of EM’s trademark flashing eyes. Orchestrally, I wonder whether the conductor Christian Curnyn set his standards too low out here in the colonies with a non-early-music band. The continuo section felt both leaden and wooden and I think they could have been better if more variety and a sometimes lighter or lither approach was encouraged. Brisk tempi are all the rage these days, I know, but sometimes they were a bit much for the singers. Maybe that’s just my usual preference for the slow asserting itself. The musical charms of the work are undeniable. On Thursday I found myself repeatedly humming the opening tag to Partenope’s “butterfly” aria. Curmyn finished this at a deliberately slightly slower tempo at which it could well have started, for my taste. Last night and today I’ve even been haunted by another of Partenope’s arias – I can’t now remember the translated text but I have identified it from the score as Voglio amare insin ch’io moro (page 73 of the pdf or 65 of the book). My favourite moment in the performance was Arsace’s Ma quai note di mesti lamenti, though it’s not so hummable – it’s the affect and the moment in the drama which is memorable. There was a little “life passing” moment which I want to record for my own benefit, though it has little to do with Partenope. Separately, I ran into T and Dx, who were boys together at the school where I once taught. I knew that Dx might be there but hadn’t spotted him until T told me he’d seen him from afar. Dx hadn’t identified T, whose appearance has undergone something of an alteration, though when I described T to Dx subsequently Dx thought that he might have seen him and recognized him without realising who he was. Is that all too complicated? As is the way of these things, I still think of them as just youngsters. At 40 they are now both older than I was when I taught them. Dx was bringing his mother-in-law (visiting from another country) and mother. His mother looks just the same, to me, anyway. Apparently, she was the foundress of Naples. That’s 2000 seats still for sale for 4 performances. Incidentally, can you see the stand-out show? It’s the matinee on the 26th. They’re a loyal audience, that matinee audience. There is a much better concession price for children at matinees but my guess (I hardly ever go to matinees) is that it’s mostly the forced loyalty of the elderly who can’t manage to go out at night. Good on them, though I doubt if they are going because they are an inherently more adventurous bunch than other opera-goers (that’s another aspect to the forced loyalty). It will be interesting to see whether Opera Australia chooses to follow the Sydney Symphony and tap into this audience on weekdays – it’s a trickier proposition than for the orchestra because the scheduling is harder, but it must surely come as the audience gets older. But back to the opera. Really, the production is the thing. It’s mostly about spotting the reminiscences of Man Ray photographs. I didn’t buy a program so I can’t otherwise judge the dreaded (on account of what he did to Tosca) Mr Alden’s reason for the surrealist slant. Maybe this is very unfair to Handel, but because I have few preconceptions about his operas, I’m pretty fine with their being treated as a regisseurial blank slate. For me the music was enjoyable but, in the first act in particular, rather generic Handel. It wasn’t until the second and third acts that he seemed to summon more piquant affects and orchestral effects. On Tuesday, Sian Pendry stood in for an indisposed Catherine Carby. She did a good job, more than good enough, though obviously I have no way of knowing whether it would have been better with CC. Otherwise, it’s very much a vehicle for Emma Matthews. Jacqueline Dark was able to put her ample bosom to good use at the denouement (think: Das ist kein Mann!) and as the enraged spurned lover made a good impression (I mean: vocally but also by way of comic timing). I don’t laugh so much as others when librettist Amanda Holden drops into vulgar colloquialisms (eg: “Don’t be a turd”), though I have no objection to them either (which is probably why I don’t find them particularly funny). I thought that Christopher Field had come along quite a lot from when I last heard him, which I think was as Tolomeo in Giulio Cesare. This isn’t a role/roll call and I am not a critic, so I won’t go through the remainder of the cast, even though there are only 2 more. I know that for some people, Handel operas can be too long. That’s not a problem for me, because I take a nap before, and the music is always of a quality, even when generic Handel, that I can be entirely engaged by it. The more music the better, so far as I am concerned. It may even be that by the second and third acts I had just adjusted to the style of the production and the music, and so was able to appreciate something which I had at first felt as merely generic. Given all those empty seats, I’d like to try to see it again to put that hypothesis to the test. That will probably depend on budgetary considerations. It is therefore self-interested of me to say that it is maddening to think of all those empty seats unsold at a price which, ipso facto, no-one will pay. It hardly seems eight years since D and I marched against the Iraq war (as did many others, in vain). D had one of those t-shirts showing Bush and Howard in a doggy embrace. This came back to mind with Cathy Wilcox’s recent cartoon, commemorating Julia G’s Washington sojourn. I have shamelessly scanned it (for fair comment purposes only, of course) from the Sunday paper which I was given leaving the SSO concert on Saturday night. D and I both laughed a long time at it. the ear (as code for the hair) – these are the primary insignia for recognition of JG. 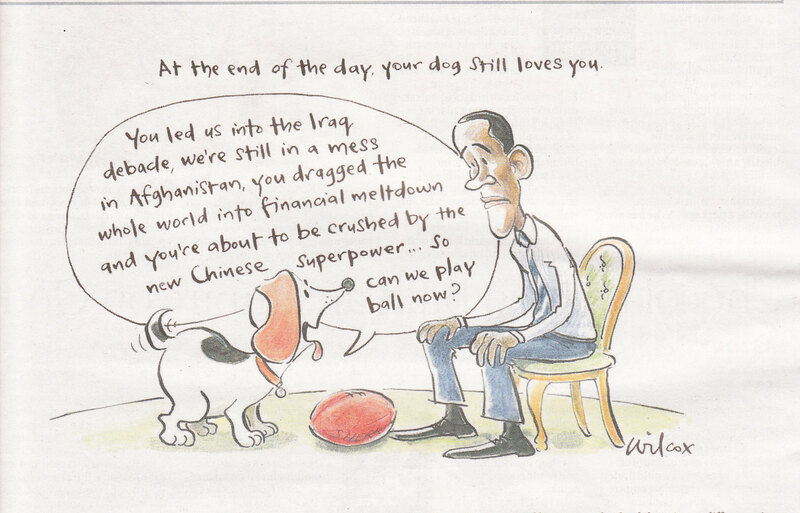 the football (this refers to the oval office antics, with a bit of a play on the dog aspect). There is one other recognisable feature in the caricature which I scarcely dare mention. It’s politically irrelevant but anthropomorphically brilliantly realised. Does anybody else see what I see? Last Sunday, as foreshadowed, I went to hear Orchestra Romantique at the Paddington Town Hall. Amazingly, I cannot remember ever having been into the Paddington Town Hall “Grand Hall” before. It is a funny room: it feels like a ballroom with minstrels’ galleries and sawn-off-at-the-bottom art-deco decoration at the sides. There is a minimal stage and the orchestra were on the same level as the audience with just a few risers for the back rows. Maybe the seating could beneficially be offset to improve the sight lines. The hall was almost full. Before the concert began, as the crowd chattered and the orchestra warmed up, it was a jumble of noise. I was worried that we were going to hear nothing at all. That fear proved misplaced. The acoustic was surprisingly crisp. Because I have already published a “plug” for this event, I am probably disqualified from offering any evaluative comment, and in any event, I am not a critic. Harriet Cunningham has given a reasonable account tempering critical rigour with encouragement. The one thing I would add to her account is that I would have preferred just a little more flexibility and yielding, that is, dare I say, warmth, especially at transitionary moments in the second and third movements of the Berlioz. That’s a question of interpretation. As to the orchestra itself, despite their small numbers, the violins kept their end up remarkably well, and in the Berlioz there was indeed some “authentic” dividend apparent in brass and especially in the sharper sound of the smaller trombones in use and the milder sound of the ophicleide and serpent in comparison to their modern replacements. The orchestra’s publicity has made much both of its intended modest admission prices and also the “family-friendly” times. In my experience, confirmed in this concert, cheap concerts create a kind of moral hazard: it is cheaper to bring the child than engage a babysitter. That hazard is increased when the concert is in the daytime on the weekend and the orchestra is working, or most of them are, for free. Unfortunately my enjoyment of the concert was very much qualified by the presence and conduct just in front of me of a child who appeared to be the child of a member of the orchestra. The child was bored and restless and at the end of the concert rushed out at the first opportunity. The seat was too high for her feet to reach the floor and she was uncomfortable if she sat back in it. She kicked her heels. She sat on the floor. She looked around. She played with various objects. She moved her chair into the aisle. She sat on the floor again. This is not an exhaustive account. The child seemed notionally to be in the care of and finished the concert on the lap of (and probably to the considerable discomfort of) an adult who might well have taken a few more sensible preventative steps to control, avoid or ameliorate the child’s conduct. Or so I would have thought, save that for all I know the child was entrusted to the adult by the orchestra member in question at the last minute. If that were so and in the absence of any more well-established relationship, the child could hardly have been taken out of the hall and down to Oatley Park to ride on the swings, which would have been best for all concerned. Some of this is my own problem: I am too easily distracted and then angered by what seems to me to be a kind of vandalism (even worse because it is sometimes even entirely unwitting) inherent in this sort of thing. The anger is compounded by a kind of internal frenzy because I want to move or say something to bring it to an end but usually end up doing neither. I know that the child’s conduct distracted others. In retrospect, I should have moved, and not been shy or self-conscious about it. I still hope that Orchestra Romantique’s venture prospers. I expect I shall go again. However, if a concert for adults is really going to be family-friendly, perhaps what it needs is a crèche in the foyer or otherwise close at hand where bored and restless children can safely and readily go. For a few years now, I’ve been resigning myself to the death of my turntable and the loss of my LP collection. I had the turntable cleaned and reconditioned, but if anything it sounded worse when I hooked it back up. D has rearranged the living room and along the way the turntable has been brought closer to the amp and a dodgy extension to the output lead has been eliminated. 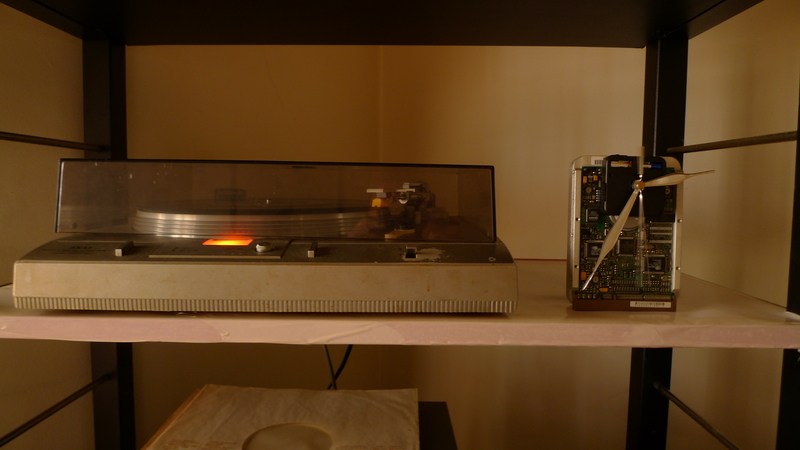 All of a sudden the turntable is OK – not brilliant, but OK. How silly of me not to check that before! Such a shame that I threw out most of my Telefunken Bach Cantatas. They were second-hand when I got them and very scratched, but it is possible that they were not in as bad knick as I thought they were. 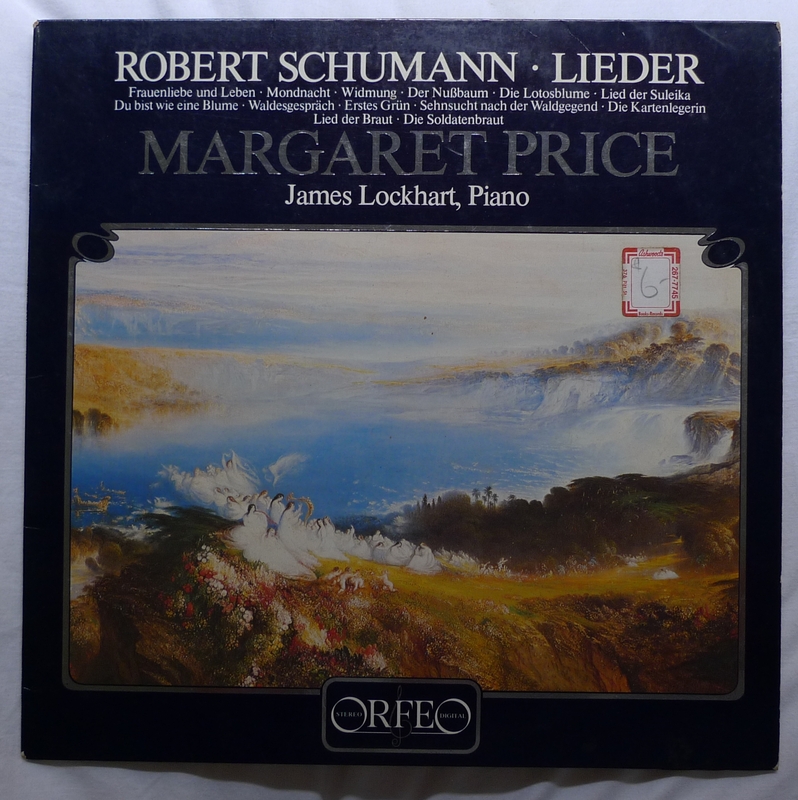 Margaret Price died earlier this year and it was news of her death which prompted me to search the record out and try the turntable. It’s good to hear her again, even if there is a point where the needle needs to be lifted over a back-tracking scratch. Ophicleide! Another Ophicleide! Serpent! – How romantic! This Sunday (6 March), at 3pm at Paddington Town Hall, the recently formed Orchestra Romantique will be giving its second Sydney concert. The first was last year. I missed that. I shall be going this time. How could I fail to, when they are featuring two ophicleides and a serpent? Guy Noble has given the orchestra a plug as has Wanderer – it seems that they were at the same party, to which I was not invited – probably wisely given my philanthropically challenged nature. W has invited me to give the concert a plug. This is it, though it is hard to see how I can add anything to what he has said already and unlikely that anyone likely to go reads my blog who has not already read his. I shall take a materialist approach. The top-price tickets are $25. There’s a bargain! Assuming all of the orchestra’s listed members front to play, that’s 54 musicians in fact, they say it’s 60! (and could be more: see comment/s below). That’s obviously not a financially sustainable proposition – even if everybody paid full price and the hall was full (capacity 600) and [contrafactually – see comment below] the entire door takings distributable equally among all, that would only be $277.77 each with an extra 20 cents or so each for conductor and soloist [correction – $250 and no tip for conductor and soloist]– but it’s worth encouraging. The main feature is the Symphonie Fantastique. To be honest, I’m not sure how this will work with a maximum of 28 [correction: 31] strings. Nick Byrne (apparently co-founder with conductor Nick Carter) will play an Ophicleide concertante work (this must be a rarity) and the program opens with Weber’s Oberon overture. Wanderer has suggested that the opening horn solo could be played by the ophicleide as well (or do I mean instead? ), but I really think that would be a step too far. On my limited exposure, I would say that the ophicleide is “romantic” in the chronological sense as a matter of music history, rather than in terms of moonlight and fairies (despite its inclusion as a substitute for the English Bass Horn in Mendelssohn’s MSND Overture). Three more concerts are foreshadowed this year “in May, October & December, featuring music by Schubert, Schumann, Liszt and Beethoven.” That suggests to me that the orchestra is planning to settle down into the sort of repertoire that the Tasmanian Symphony Orchestra (until last year) had a go at bringing to Sydney. It’s repertoire which can be carried off by a smaller orchestra. I was sorry to see the TSO give up its (pretty ineptly managed and marketed, in my opinion) forays to Sydney, and I really hope the OR’s venture prospers. PS: Parking can be tricky in Paddington. The public transport planner for travelling from Museum Station to Paddington Town Hall (I allowed for a 2.30 arrival because it’s General Admission) very helpfully offers as its first suggestion that you walk (1945 metres; 29 minutes). You are currently browsing the Stumbling on melons blog archives for March, 2011.